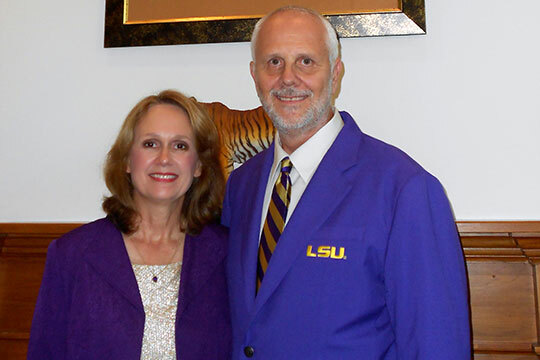 Ken and Susan Garrett met at LSU and attribute the professional opportunities they have had to the education they received here. It was the alumni at Texas A&M, however, that inspired them to give back to their alma mater. The Garretts’ son attended Texas A&M. Ken said seeing the spirit of the school’s alumni and the way they give back humbled him. “We need to have that same spirit for our school, to give generously,” he said. Ken and Susan began giving four years ago, making periodic donations to several funds. Then, they considered their gifts as a way to make an impact on the university. “We’d been thinking of a bigger way to give back to LSU, and Wayne Miller and Lindsey Kelly encouraged us to consider it,” Susan shared of her and Ken’s collaboration with the college’s development team. Ken said Chevron’s matching gift partnership with the LSU Foundation helped make it possible for him and his wife to fund a scholarship opportunity. Warner Williams, vice president of Chevron in the Gulf of Mexico, says the giving program reflects the company’s approach to community engagement.